Update: This resources is outdated and unmaintained : it won't work with recent version of Krita. Check the 'extras' category to find the most recent brushes. This brush pack is a free, minimalist, compact, with black&white thumbnail brushpreset kit for the free and open-source software Krita. It was designed for my own productivity. The icons were designed for less color pollution on screen, and tested during monthes incrementally on git. a. Digital brush, rounded, flat, angular. Opacity on pressure. F symbol = flow opacity. h. Tools : Eraser, Warp, Alchemy, Clone,Line. Brushes CC-0 /public domain . Demo picture on this page : CC-By , attributed to David Revoy. 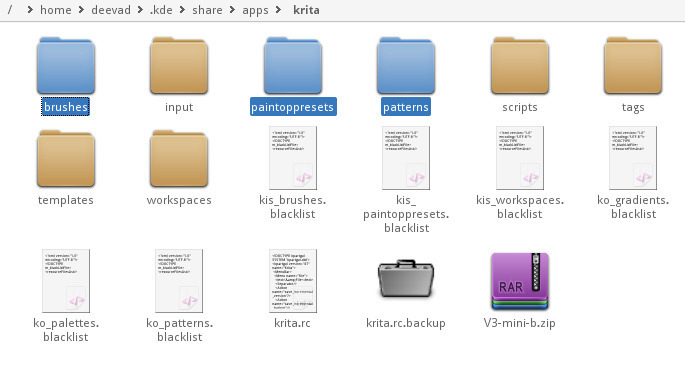 Unzip, and copy/paste the folders into your Krita user-preference directory : screenshot on Linux .You can open your preference directory inside Krita : Edit > Ressources > Open Resources Folder. Restart Krita. Support : If you need support for installing brush in your operating system, connect now to the Krita developper chat here . Fill a nickname and ask your questions, someone will reply to help you. (Note : It can take some time, be patient ). Versions: this is V5.0, previous releases pages : V4.0 | V3.0 | V2.1 | V1.0a . mentioned at the end of the article, 15 august 2014 . Thank you so much, I've been using your brushes since v3 and I like them so much. I can't think in doing an artwork in Krita and not using them. Thank you for your "less is more" set. I will try it as soon as I come back from summer holiday. It probably deserve a full article about it, but for the moment I won't risk to write it as it's still a mess in FLOSS world : sometime missing (Mypaint), sometime limited option/incomplete (Krita) , sometime weird GUI (Gimp). * Mypaint only support Flow Opacity. * Krita is a mess for Flow/Normal Opacity : you can choose to have sensor on Flow or have sensor on Normal opacity ( it will make the other setting linear ) , but you can't use both sensor. That's why the pressure on opacity of Krita can't match the creamy soft pressure opacity of Photoshop for the moment ( just a pressure on Flow + Opacity at the same time ). My brushes here are tricking this to make the 'flow' behaves. But it's not easy. * Gimp sort of do it right with a Opacity ( Normal Opacity ) and a Flow opacity ( Rate ). it's just you have to open 4 modal dialogs and do the ping-pong between them to tweak the dynamic of a setting. --> Opacity of each single dab ( disk or whatever shape of your brush ). Eg: In a common digital painting stroke, each dab overlap the previous one. 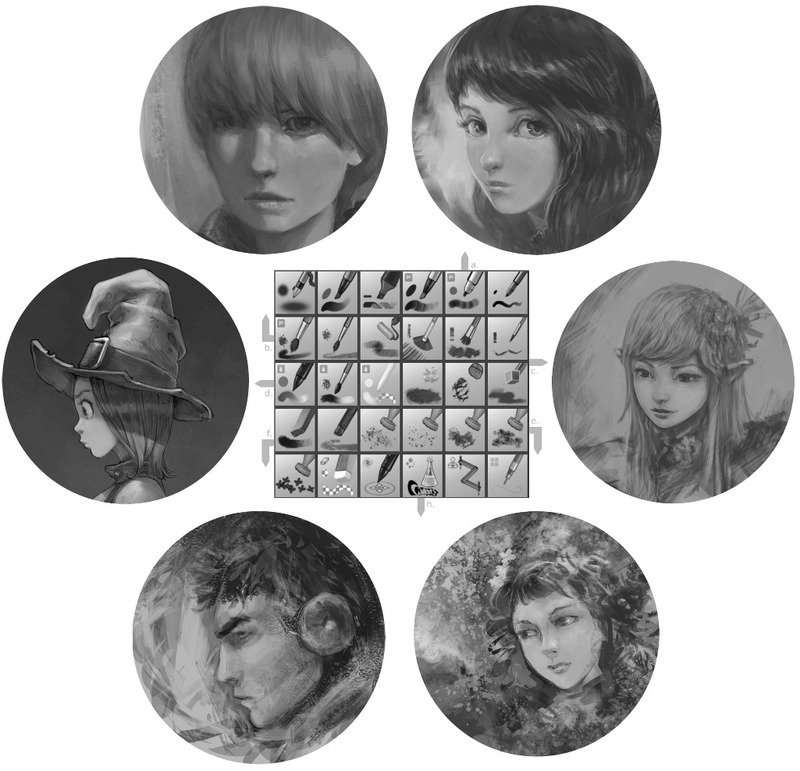 you'll see each dab disk drawed on canvas having a 20% opacity but building opacity on the previous one. So the overlap will go by 40%, 60%, 80%, 100%. The core of your stroke will be then 100% opacity even if you set your flow to 20% in this exemple. --> Opacity of the resulting stroke ( can be composed of X dab of disk or whatever shape of your brush ). Can be certainly named 'resulting stroke opacity' . This opacity apply to all the stroke. You can paint with this opacity a single stroke, and overlap your own stroke without seeing the overlap ; even if you are using a low opacity. Both method are useful when working the edges in a painting, combining both often result as a game to balance toward the quality of one type, and shrink the quality of the other in consequences. *Flow opacity* will create more muddy color mix, soft stroke, and flabby edges. It has advantage in smooth color mixing, depiction of soft shaders like skin, or peach skin, or velvets, etc... and make gradient creation easy. *Normal opacity* shows more the layers of strokes, and so creates more dynamism and has advantage to produce low opacity hard edges. The lack of own overlap inside the stroke make it look really digital but also make it a better tool for laying constant colors, values, or cleaning area. Could you give me recommended and minimum Hardware requirements for Krita v5, please ? @Tharinda : I can, but it's only 'in my opinion' , and also only on Linux ( ex; Xubuntu; or Ubuntu Gnome, or Kubuntu ) as I don't own any Windows license since 5 years. By the way, I'm glad to inform that Krita 2.8 series works well in my laptop with Intel core i5 2.5Ghz, 2.6 GB RAM. In my graphic tablet, tilt function doesn't work because there is a hardware malfunction. I like to know that without tilt, does Krita make any particular inconvenience for me, specially when I'm going to use wonderful brushes in Krita? @Tharinda Divakara : Good news for Krita. No problem if you don't have tilt ; really few brushes use Tilt and the effect produced isn't very important. A stylus with pressure is perfect; I painted during years with a little tablet with only 512 level of pressure and no tilt. About Colorimeters ; in a nutshell : it's a device ( often USB ) you can stick on your screen from time to time to help your computer to see what's going on about your monitor's colors ; and adapt the color of your screen to something more standard, or pleasing. Because sometime, screen are too dark, too bright, too red, or to bluish. A colorimeter can fix this, and also tell your computer what's are the limit possibilities of the color your screen can display. So, it's help to convert other color space ; for example to work for printing stuff. I'm glad to show my first digital painting from Krita. Thanks David :) much appreciated! Hello, please tell us in detail how to load brushes on mac os. on windows installs easily on mac did not understand. Sorry, but I never owned a Mac or Apple product and I have no idea how it works. Please, read the article; and the text in red on the top is here for a reason.